The proper cure of allergy is not present in allopathic world, they only stops the symptoms and the course of medicines is compulsory throughout the season. The antiallergic drugs possess many side-effects, which can leads to the complications sometimes. But if we talk about Ayurveda there are some medicinal herbs which can help to get rid of seasonal allergy with no side-effects. Also the cause of allergy is the stomach, incomplete digestion of food releases toxins and which results in allergies. These toxins are foreign particles to the body and with the collection of these toxins, hyper sensitivity condition arises. Which in results shows sensitivity for the foreign allergens and raise problems. 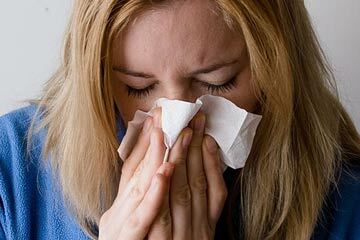 Now the question arises, How Ayurveda can help you to relief from seasonal allergy? The stem of this herb is used in the treatment of allergy. It is helpful in reducing stomach pain and nausea. Possess antimicrobial properties and proven to be beneficial in respiratory disorders. The compound ursolic acid present in this herb helps in heal asthma. This is antimicrobial and helps in treating in the respiratory tract microbes. It also helps in eradicating cough from the body. The bark of this tree is used in the treatment of allergy. It is helpful in cold and cure skin allergies. Antioxidants present in this spice improves the immune system of the body. It is also anti- inflammatory and used in the treatment of allergies. Helpful in reducing stress and fatigue related problems. It also increase the immunity of the body, which helps in fighting against allergy. Sirish or Albizia Lebbeck is a medicinal plant which possess alkaloids, tannins, saponins and flavonoids which has medicinal properties. It is used in snake bites, also it is used in stings from poisonous animals. It prevents allergic reactions. It is helpful in treating cough and bronchitis. It is also helpful in headache and fever. It is useful for the treatment of allergies and asthma because it has alkaloids in its leaves. The use of Madhuyashti can provide relief from cough. It is used to cure sore throat and dyspnoea. The humidity level should be maintained in the house. To prevent the entry of pollen and anthers, windows should remain generally closed. Regular cleaning and monitoring of maintenance would be helpful, of the air filters and air conditioners, if they do not provide enough fresh air. Dust particles are main cause of allergy, so they should be controlled in the house. To prevent allergies there can be various treatments but the best is through Ayurveda. The herbs mentioned above can be the best remedy and answer of the question that; How Ayurveda can help you to relief from seasonal allergy? The simple remedies as explained in the article, can be useful to avoid allergy and its symptoms. Disclaimer: The information and views presented in this article belong to the author. Zigverve.com hasn’t verified the given information, and cannot be held responsible for any outcome. If you follow any instruction provided here, you agree to follow them at your own risk. Please read the detailed disclaimer here.